BEIRUT (Reuters) - The Syrian government vowed to take back the Israeli-occupied Golan Heights as its allies and enemies alike condemned U.S. President Donald Trump on Friday for moving to recognize Israeli sovereignty over the territory seized in war. Trump's statement on Thursday marked a dramatic shift in U.S. policy over the status of a disputed area that Israel captured from Syria in the 1967 Middle East conflict and annexed in 1981 - a move not recognized internationally. Against this backdrop of hostility toward the U.S. move, Secretary of State Mike Pompeo visited Beirut where he took aim at Israel's main regional foes - Hezbollah and its backer Iran - and declared the success of U.S. sanctions against them. It follows the U.S. recognition in December 2017 of Jerusalem as Israel's capital - a decision that also stirred international criticism as the city's disputed status remains at the heart of the Israeli-Palestinian conflict. Israeli Prime Minister Benjamin Netanyahu thanked Trump for his gesture "at a time when Iran seeks to use Syria as a platform to destroy Israel". It could help Netanyahu in the midst of a tough re-election battle, analysts said. The Syrian government said the Golan was an "indivisible" part of Syrian territory and recovering it "via all means guaranteed by international law is still a priority". It said United States with its "stupidity and arrogance" had no right to decide the fate of the area and any move to recognize Israeli sovereignty over it was "an illegal action with no impact". 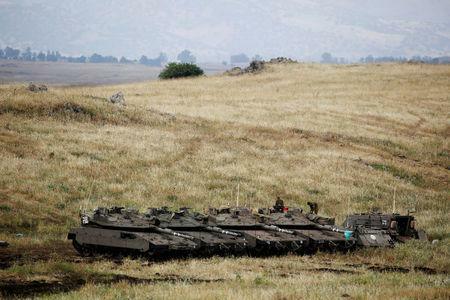 U.S. OFFICIAL: ISRAEL "COULD NOT GIVE UP THE GOLAN"
Jason Greenblatt, a senior White House adviser, said on Twitter that "under any conceivable circumstance, Israel could not give up the Golan ... To do so would endanger Israel's very existence". But Fouad Mundhir, a Syrian whose home village is in Israeli-occupied Golan, said Trump was "cancelling the will of an entire nation. Germany said any change in borders should be "done through peaceful means between all those involved", while France said it did not recognize the Israeli annexation of the Golan and any recognition was contrary to international law. The Arab League, which suspended Syria in 2011 after the start of its civil war, said Trump had paved "the way for official American recognition" of Israeli sovereignty over the Golan and called this "completely beyond international law". In Lebanon, Pompeo said the United States would continue to use "all peaceful means" to choke off funding that "feeds Iran and Hezbollah terror operations".